This small box in the shape of a coffin attests to the incredible imagination of its maker. 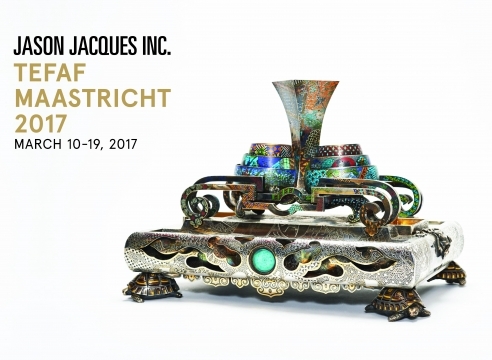 Drawing upon a various range of visual references, Alfred Daguet, by the turn of the century, created a large number of similar objects through which he expressed his creative talent. 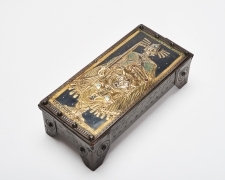 The Valiant Knight Box was made in metal repousse and decorated with glass cablochons. 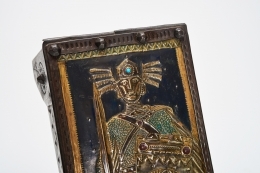 Using ancient coffin iconography, the most visually striking element of this box remains the figure of the knight depicted on the upper side of the box. Holding a sword and a shield, on which the head of a bull is depicted, the figure of the knight is shown encompassing a wide range of iconographical sources that make him a stylistically hybrid figure.